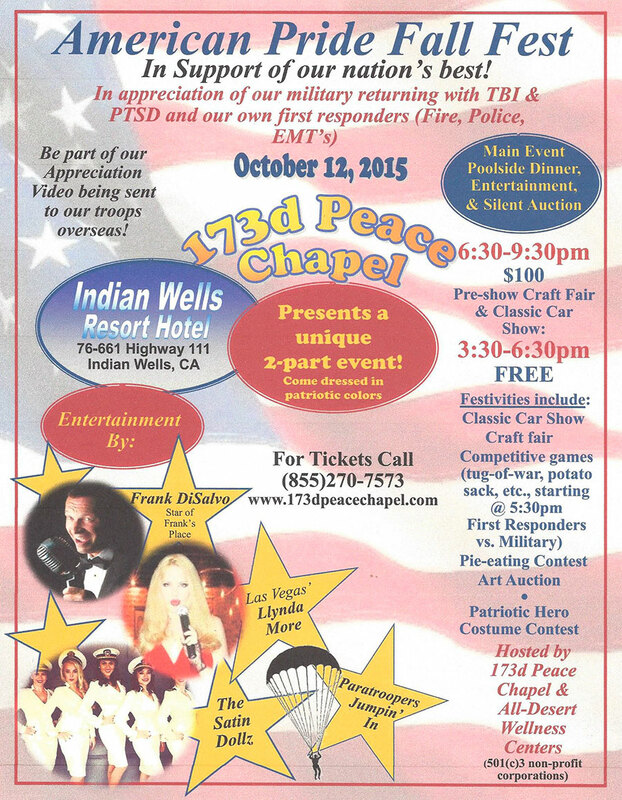 In support of our nation’s best and in appreciation of our military servicemen and women, as well as our own first responders (police, fire, and EMTs), the 173d Peace Chapel is having the American Pride Fall Fest at the Indian Wells Resort Hotel in Indian Wells, CA on October 12th. It’s a two-part event, with festivities including a classic car show, pie-eating contest, and fun games with first responders going up against military, followed by a poolside dinner and show later in the evening. Entertainers will include Frank DiSalvo of Frank’s Place, Las Vegas’ own Llynda More, the popular singing and dancing group The Satin Dolls, and will feature sky divers dropping in from the sky! The American Pride event will be on October 12th, with the pre-show festivities of the craft fair, car show, games and booths running and sky divers jumping in at 6:00. Competitive games with our military and first responders stating at 4:30. First part of event last from 3:30PM to 6:30PM being free to the public. The main event of the poolside dinner and show with Frank DiSalvo, Llynda More, and the Satin Dolls goes from 6:30PM to 9:30PM and is $100 per person. Be a part of a video being made of the event to go as an appreciation Thanksgiving gift to our soldiers overseas. For more information about this event or to make a donation, contact the 173d Peace Chapel at 855-270-7573 or click on the donate button on this home page of our website or contact us by e-mail at info@173dpeacechapel.com. Or buy tickets ticket’s for the American Pride Fall Fest event on this page via pay pal. Don’t miss this opportunity to thank our soldiers and first responders for all they do and to also have a ton of fun! Buy tickets for our military, fire fighters , police and ENT’S that we are honored to be coming as our guest. All tickets are tax deductible, we are a 501(c) 3 corporation.